WASHINGTON — Washington, DC police say 13 people are dead in an attack at the Naval Sea Systems Command Headquarters, where 3,000 people work. Suspected shooter Aaron Alexis is among those killed. This blog follows the events as they unfolded Monday. 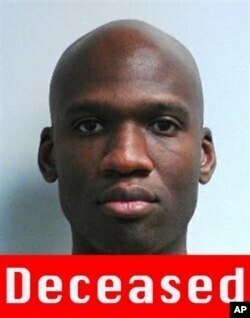 BREAKING: DC Police lifts shelter-in-place; has single and sole shooter, deceased suspect Aaron Alexis. Lanier: We have exhausted all means available to eliminate that possible last suspect [who was previously believed to be at large]. We are comfortable to lift shelter-in-place in the area. We feel we have single and sole person responsible for shooting. Witness interviews and some camera views suggested there was potential that another shooter was involved. We believed best action to take was to make sure community was safe, first. We have spent last several hours trying to go through everything possible until we were 100 percent comfortable we cleared that information. Parlave: Suspected shooter Aaron Alexis had legitimate access to Navy Yard as a result of his work as a contractor. He utilized a valid pass to gain entry to the Navy Yard. FBI expected to spend another 48 hours at the Navy Yard. Most people alive have been cleared from the scene. Gray: Eight people incurred injuries. Of the eight, three were shot, including a Metropolitan police officer. Two other civilians suffered minor injuries. The other five injuries range from stress reactions, like chest pain, to contusions from falling. There's no reason to think they won't be fine. We anticipate traffic patterns will be back to normal on Tuesday morning, and bridges will be open. We've been in close contact with White House. The president has reached out through his staff to connect with us as this process unfolded throughout the day. 8:25 pm Vice Admiral William French confirms 27 Navy Yard casualties: 13 dead, including shooter, and 14 injured. All 12 victims killed were civilians. French says approximately 2,000 employees remain on site at naval installation, awaiting FBI interviews. Evacuation will take a few hours. 6:30 pm Police arrest a man outside the White House after he threw lit firecrackers over a fence at the presidential compound. Officials have not stated a motive or drawn a connection to the Navy Yard shooting, but the incident put an already tense Washington on even further edge after Monday's deadly rampage. Gray: We're still seeking the identity of the person identified as having a drab olive-colored uniform, a man about 50 years old. I want to extend on behalf of the entire city our heartfelt condolences to the families of those who were killed in this horrific tragedy. Family and friends wait to greet staff of the Navy Yard as they are bused to Nationals Park, in Washington, Sept. 16, 2013. There were 13 tragedies, 12 of which occurred at the site, including the shooter, and one at the hospital. No known motive at this juncture. There is no information to suggest it was terrorism at this point. We will continue through the night with this investigation, and obviously in the days and weeks ahead. Lanier: We are still continuing to ask our community to remain out of the area and shelter in place. We still are working diligently to verify or clear whether we have the last person of interest. This is still an active investigation. We still have a lot of law enforcement in the area. Please stay out of the area until we give the all-clear. Our officer from the Metropolitan Police Department is out of surgery and is stable. He's going to be okay. Traffic closures across M Street will continue throughout the night. Parlave: No further details at this time about the deceased shooter, Aaron Alexis. Public is encouraged to look at photo of the shooter and share tips to 1-800-CALL-FBI. This image released by the FBI shows a photo of Aaron Alexis, who police say was the gunman killed at the Navy Yard shooting, Sept. 16, 2013. No piece of information is too small as authorities try to piece together the recent movements and contacts of the suspect. Lanier: There is misinformation getting out through a variety of sources. To the media, if you have sources inside law enforcement agencies, they are not confirmed unless they're coming through the official body or through the FBI. If you have sources reporting something, try to verify before you put it out. Misinformation results in additional calls that divert resources. Holmes Norton: The fear rises when people don't have information and don't feel safe. This is a thriving community of residents. It's not a place just for large federal facilities. To residents coming home today, the response of the police, taking down the shooter so quickly, reminds me again that this is the safest city in the United States. Not safe from attack, but safe. ​The police and responders saved many lives. When this investigation is over, we'll have a sense of just how many. Tonight, we want to say to residents, we don't think there's anything to fear in this city. "As a mark of respect for the victims of the senseless acts of violence perpetrated on September 16, 2013, at the Washington Navy Yard, by the authority vested in me as President of the United States by the Constitution and the laws of the United States of America, I hereby order that the flag of the United States shall be flown at half-staff at the White House and upon all public buildings and grounds, at all military posts and naval stations, and on all naval vessels of the Federal Government in the District of Columbia and throughout the United States and its Territories and possessions until sunset, September 20, 2013. Family and friends wait to greet Navy staff as they are bused to Nationals Park, in Washington, Sept. 16, 2013. I also direct that the flag shall be flown at half-staff for the same length of time at all United States embassies, legations, consular offices, and other facilities abroad, including all military facilities and naval vessels and stations." 5:30 pm U.S. Secretary of Navy, Ray Mabus, is with survivors and their families at the Washington Nationals baseball stadium, the designated reunion point. Mabus has assigned a "designee" status to all Navy Yard victims, permitting them to get care at the Walter Reed National Military Medical Center, if needed. 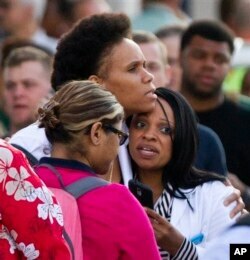 4:46 pm Navy officials say the dead gunman was a U.S. Navy veteran and a native of New York. Aaron Alexis served in the Navy from May 2007 to January 2011, according to The Guardian, quoting Rear Admiral John Kirby. Alexis spoke Thai, worked as a waiter at a Thai restaurant and worshiped at a Buddhist temple in Fort Worth, Texas, according to The Washington Post. 4:29 pm BREAKING: FBI confirms identity of deceased shooter as 34-year-old Aaron Alexis of Fort Worth, Texas. FBI poster of Alexis is available here. 4:20 pm BREAKING: 13 fatalities, including shooter. DC Mayor Vincent Gray, Police Chief Cathy Lanier and Valerie Parlave, FBI assistant director of Washington Field Office, address press. Parlave: No piece of information is too small. We are looking to learn everything we can about his recent movements. Public can phone tips into 1-800-CALL-FBI. Gray: Shooting is the "worst tragedy [in the city's] recent history." A Metropolitan Police Department officer walks near the Washington Navy Yard, Sept. 16, 2013. One suspect is dead, a second suspect has been ruled out, a third suspect is still believed to be at large. There are no reasons at this point to suspect terrorism. This evening's Washington Nationals baseball game, blocks from shooting, postponed until Tuesday afternoon. Lanier: This is one of the worst things we've seen. Officers moving through the building found multiple victims, with gunfire still going on. There is no question suspect would have kept shooting [if he was not engaged by police]. Suspect did not take his life. He was killed by police. Residents and businesses in the Navy Yard area are being asked to shelter in place. Next update expected at 6 pm, with final press conference of the day at 10 pm. Of the three victims from the Navy Yard shooting being treated at the hospital, the first individual is a Metropolitan police officer, who is in surgery. He has been in surgery for several hours. Expected to make good recovery. Second individual is in good spirits, ordering doctors and nurses around, and they jokingly told her they were in charge. She is in surgery and is expected to have full recovery. Third individual is not in surgery. She is a "very lucky lady." She suffered a significant wound to her head but it did not puncture her skull. She will recover without surgery. She's in very good spirits. 3:55 pm Ray Mabus, U.S. Secretary of the Navy thanks first responders. Relatives can call 202.433.6151 or 202.433.9713 for information about family members. 3:45 pm Law enforcement officials expected to address press around 4 pm. 3:30 pm Washington Hospital Center press conference expected momentarily. 3:22 pm Suspect killed is identified as Aaron Alexis, 34, according to multiple news outlets citing federal law enforcement officials. 3:30 pm U.S. Senate building closed until at least 5 pm while police search for second suspect, on orders of Senate Sergeant at Arms Timothy Gainer. 2:35 pm Authorities are scrambling to determine the identity of the shooter killed at the scene. Incomplete reports and rumors are emerging, but nothing has been confirmed. We are tracking this. I’ve spoken with the Sergeant at Arms, and in light of the events at the Navy Yard, we will recess the Senate until tomorrow morning. Gray: At this hour, it appears we have at least 12 fatalities. We're continuing to try to determine how serious situation is. It doesn't get much more serious than that. District of Columbia Mayor Vincent Gray briefs reporters on the shooting at the Washington Navy Yard in Washington, Sept. 16, 2013. One police officer is injured. There is no known motive at this stage. We don't have any reason to think it's a terrorist event. Continuing investigation. Police Chief Lanier: Actions by police officers reduced lives lost. Our gratitude to frontline officers and also to U.S. Park Police, who ran into danger. We're confirming at least 12 fatalities. We had a few additional folks injured, not fatally. We have additional officers injured, only one by gunfire. Other injuries sustained by multiple police agencies on the large response inside. Offficially now transitioning to FBI lead. FBI will lead entire investigation as unified process. Any additional information anyone wants to share can be called in to: 1-800-Call-FBI. Other suspects are white male, between 40 and 50 years of age, wearing what appears to be a tan military uniform and a beret-syle hat. Looking also for a black male, between 40 and 50 years old, in an olive military-style uniform. Approximately 5 foot 10 inches, 180 pounds, medium complexion with graying sideburns. No indication of any motive. We are updating and asking family members to call NCIS at 202.433.6151 or 202.433.9713. Impact of area - large part of area is in lockdown. Asking residents to stay in their homes and stay out of the area. U.S. Capitol Police personnel keep watch on the East Plaza of the Capitol as the investigation continues to the shooting at the nearby Washington Navy Yard, Sept. 16, 2013. There are multiple agencies on the scene. Lots of support from regional counterparts. There are few questions we can answer at this point. Another update will come in two hours. Multiple pieces of information at least two other individuals were seen with firearms, wearing military-style uniforms. 1:13 pm DC school officials raise number of schools on lockdown from six to eight as authorities search for two suspected shooters. ​I've been briefed by my team. We still don't know all the facts but we do know that several people have been shot and some have been killed. We are confronting yet another mass shooting, and today it happened on a military installation in our nation's capital. It's a shooting that targeted military and cilvilian personnel. These were men and women going to work, doing their job. They were protecting all of us. They were patriots and they know the dangers of serving abroad ... but today they faced the unimaginable violence that they wouldn't have expected here at home. I want the investigation to be seamless so that federal and local authorities are working together and as this investigation moves forward we will do everything we can to make sure whoever carried out this cowardly act is held responsible. We stand with the families of those who have been harmed. They're going to need our love and support. BREAKING: One shooter dead. Authorities are searching for two other suspected shooters. Suspects are believed to be wearing military-style uniforms but Chief Lanier says there is no reason to believe they are military personnel. Lanier: Still very preliminary. Still a lot of work to be done. Will be doing another briefing in next two hours. DC Police Chief Cathy Lanier briefs reporters on the shooting in Washington, Sept. 16, 2013. ​Initial call for shooting came in shortly after 8:15 am. Units on the scene within 7 minutes of first call coming in. Multiple shooter teams from Park Police, U.S. Marshalls, FBI and DC police. One MPD officer shot in engagement with the shooter. One shooter believed involved with this is deceased. Other casualties. Multiple victims inside that are deceased. Will update once numbers are confirmed. Potentially have two other shooters that we have not located. Not confirmed, but one shooter is a white male last seen around 8:35 am in a khaki, tan military uniform, short-sleeve with a beret hat, appeared like a Navy uniform. Last seen with a handgun. Looking for another black male, approximately 50 years of age, who may have been in posession of long gun. Wearing olive drab, possible military-style uniform. No reason to believe the suspects are military personnel but we do believe they are wearing military-style uniforms. Tips can be called in to 202.727.9099. Gray: A shooter entered building 197, which is a naval sea command and began shooting. Police department active shooter team responded immediately, launched search for shooter and engaged at least one person along the way. We know four wounded, removed from scene. Still trying to confirm number of fatalities involved. Will do that later. As far as we know, this is an isolated incident. We don't know of any other instillations involved. We ask all residents to stay out of area. This is an active investigation. Because this involves the military and the federal government, we are actively and directly in contact with the White House. 11:51 am One gunman is dead, according to CNN, NBC, and the Associated Press. More information is expected momentarily, as DC police chief addresses press. 11:50 am U.S. Navy say emergency personnel remain on the scene and shelter in place order is still in place. NCIS, FBI and DC police are on the scene. 11:49 am Police spokeswoman says there was no shooting at Bolling Air Force Base, as reported by some new outlets. She says DC mayor and police chief expected to address the press in about 20 minutes. Hospital received three gunshot victims, all in critical condition. Patients include one male DC police officer and two female civilians. One patient is in operating room. Another going into operating room shortly. One male patient has multiple gunshot wounds to legs. Another female shot in shoulder. Third patient, female, has gunshot wounds to head and hand. Hospital in discussion with individuals at scene. Not sure yet how many will be coming to hospital. Victims not able to give any information about what happened to them. They're in pain and distressed. We understand there are individuals at the scene who will not be transported because they are deceased. Orlowski says "let's pray for individuals at the Navy Yard" and promises to return with more updates. I have complete confidence in our first responders, and I continue to be completely focused on this very difficult situation. 11:20 am Police update casualties, saying 12 people shot, at least four killed. Of the wounded, six are civilians, two are police offficers. Pentagon so far confirming only one dead. 11:07 am Police say family members separated by crisis may reunite at National Stadium Parking Lot B. 11:00 am DC police expected to address press in next 15 minutes. 10:55 am Police lockdown six D.C. public schools and one administrative building as a precaution. Authorities are urging people in the area to stay inside. 10:40 am Authorities lift ground stop at Reagan National Airport. Flight operations return to normal at Reagan National after more than two dozens flights were put on temporary hold by the Federal Aviation Administration. 9:45 am Federal Aviation Administration grounds planes at Reagan National Airport. The U.S. Navy says several people have been wounded in a shooting at the Washington Navy Yard. A person with a gun was reported inside the Naval Sea Systems Command Headquarters building early Monday. Via Twitter, the Navy confirmed "several injuries with reports of fatalities." News reports say one of the wounded is a police officer. Security personnel were searching for the shooter. The White House announced that President Obama has been briefed on the situation. The Washington Navy Yard is located about two kilometers from the U.S. Capitol. The Naval Sea Systems Command's headquarters is the work place for about 3,000 people. The Command is in charge of engineering, building, buying and maintaining ships, submarines and combat systems. 8:15 am DC police receive call about shooting at Washington Navy Yard.